Which Conventional Skiing Wisdoms, if any, are true? Always, or sometimes? Why? Why not? While learning a particular skiing maneuver, such as at the start of a ski lesson, goals may be set. Commonly, certain aims are listed by would-be learners as desirable, or even as given truths. These conventional skiing wisdoms may be the ones you hear shouted at learning skiers as their mates and friends attempt to teach them how to ski. Or you might hear them given as gospel in the bar any time after noon, and sometime s before. Some might have once applied to skiing, but have become obsolete due to equipment changes and technique or slope-grooming improvements. Some have likely been "poached" when overhearing a ski lesson; when an instructor says to bend the knees more, the point of reference is how much the knees have been bent already, and an added bend may be too much for a bystander not in the lesson. Actually, there is some or much truth in a number of these beliefs, but many have pitfalls. Some are downright wrong. If you wrongly believe, you are not getting your full measure of enjoyment from your skiing time. 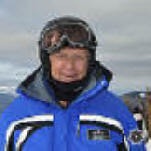 You are a candidate for further learning so you can rethink your views and thereby have more fun on the slopes. Read on to help find out why. A ski lesson is a good place to explore reasons why these "wisdoms" are often counter-productive to skiing goals, for in a lesson you can practice and experience physically whether these "truths" work while you are having their variables explained. In Learning to Ski/Ski Better/SkiMyBest, have an open mind. A conventional wisdom may have become part of your skiing style, so feels right just as the wrong use of a word in a sentence may sound right to you because you have used it that way many times. Thus a modification of ski technique might be logically better, but not feel as good as your pet Conventional Skiing Wisdom does--at least at first. So if the logic of the suggested technique makes sense to you--or even if it doesn't, try it long enough to overcome possible initial muscle-memory (really the brain) resistance. But ultimately your choices of how to ski are yours alone, and should fit your preferences and your anatomy. And in so many cases, the right answer to a skiing question is, "It depends!" 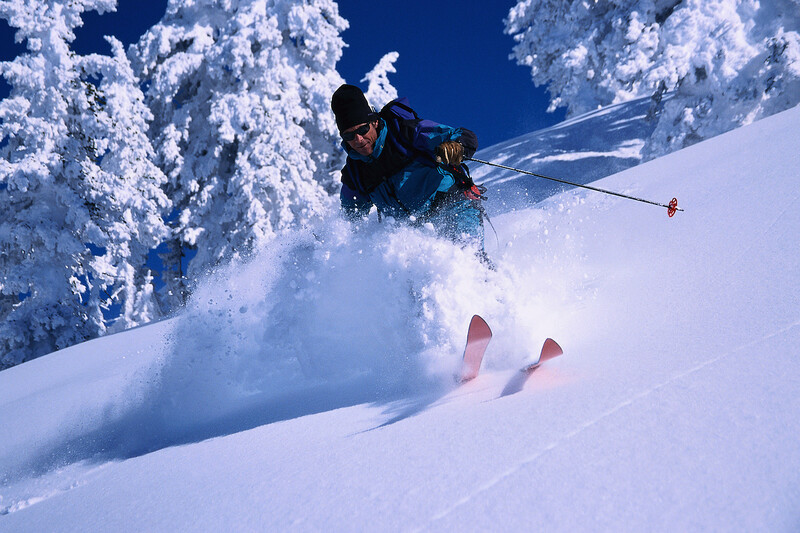 Click on each of these conventional skiing wisdoms for possible answers to "Are any true? When? Why? Why not?" CSW #1: "Keep the feet and therefore the skis together." CSW #2: "Sit back when skiing powder.". CSW #3: "To turn, shift your weight.". CSW #5: "Push your skis (some say 'cut' them).". CSW #6: "Up-unweight before turns". CSW #7: "Wind-up the upper body to initiate turns." CSW #8: "Skiing moguls ruins your knees, or back." CSW #9: "If a skier looks good, the skier is good." CSW #10: "Beginning skiers can learn from their skiing friends." CSW #11: "Skiing faster is the way to learn to ski." CSW #12: "Practice makes perfect." CSW #13: "Don't wax skis; they would then go too fast." CSW #14: "For my height I need skis of a certain length." CSW #15: "After one ski lesson, I should be able to 'ski the mountain'." CSW #16: "Fast skiers are out of control." CSW #17: "Bend your knees while you ski." CSW #18: "Turn the outside ski first." CSW #19: "Skiing is dangerous." CSW #20: "New shaped skis are just a fad; the fad won't last." CSW #21: "Old people can't ski well.". CSW #22: "Kids have to use the wedge more than adults do." CSW #23: "Skiing makes my thighs hurt (or calves, or etc.)." CSW #24: "Running gates or racing is no fun; I'm not competitive." CSW #25: "Bend low to ski like the racers sometimes do." CSW #26: "Carved turns are best.". CSW #27: "I use the snowplow for control." CSW #28: "Buckle your boots tightly to make your boots stiff"
CSW #30: "The Skier's Responsibility Code will keep me safe"
CSW #31: "Put (or keep) the weight on the balls of the feet"
CSW #32: "Footbeds in my ski boots are not important and neither is boot alignment"
CSW #33: "Always ski in balance"
CSW #99: "What is your favorite conventional ski wisdom topic?" This "Conventional Skiing Wisdoms" page last modified 11/03/2017 07:21:37 AM. Did you come here from a link on another website? For latest version of this page, copy to your browser: http://www.SkiMyBest.com/skiCSW00.htm. Copyright © 2013, 2014, 2015, 2016, 2017, 2018, 2019. William R Jones..